Jacob Safra (1891-1963) was born to a religious Sephardic family in the Jewish community of Aleppo, Syria. He was from a long line of Ottoman merchants and bankers. When the Ottoman Empire collapsed, Safra opened a new banking business in Beirut. His bank soon became the most trusted financial institution for the region’s many Jews. When things became difficult in Arab countries following the establishment of the State of Israel, Safra moved his family (with four sons and four daughters) to Italy, and then to Brazil. There, Safra and his sons founded a new bank in São Paulo in 1955. While eldest son Elie Safra (1922-1993), and third son Moise Safra (1934-2014) played smaller roles in the family business, the most prominent of the brothers was undoubtedly Edmond Safra (1932-1999). He opened a branch in Geneva, and transformed an initial $1 million into $5 billion in less than three decades. He also founded the Republic National Bank of New York, which grew to 80 locations, making it the third largest bank network in the city (after Chase and Citigroup). Edmond later opened financial institutions in Luxembourg and Russia. The latter would prove unfortunate, as many believe his “accidental” death in a house fire may have been an assassination by Russian mobsters. Today, Banco Safra is run by youngest son Joseph Safra (b. 1939). His net worth is estimated around $25 billion, making him the richest banker in the world. The Safras have always been famous for their incredible generosity. They have funded countless schools, hospitals, universities, and charities. Edmond Safra was particularly interested in building and restoring Jewish sites, and paid for synagogues all over the world, including in Manila, Istanbul, and Kinshasa. He financed the first new synagogue in Madrid in 500 years, and saved an ancient synagogue in France from demolition. He also refurbished and funded the tombs of Rabbi Meir and Rabbi Shimon bar Yochaiin Israel, and prayed at the tomb of the former each year before the holiday of Shavuot. Several medical centres and university faculties around the world bear his name, and the Safra family was one of the founders of São Paulo’s most renowned hospital. He established the International Sephardic Education Foundation to provide scholarships for those in need, and the Edmond J. Safra Philanthropic Foundation continues to give millions to charity each year. The Safras stay out of the public eye, and hold on to their faith – as well as a strictly kosher diet. Most recently, they paid for the beautiful new Moise Safra Centre in Manhattan. In 2014, Joseph Safra purchased one of London’s most iconic buildings, the Gherkin (left), for a whopping £700 million. 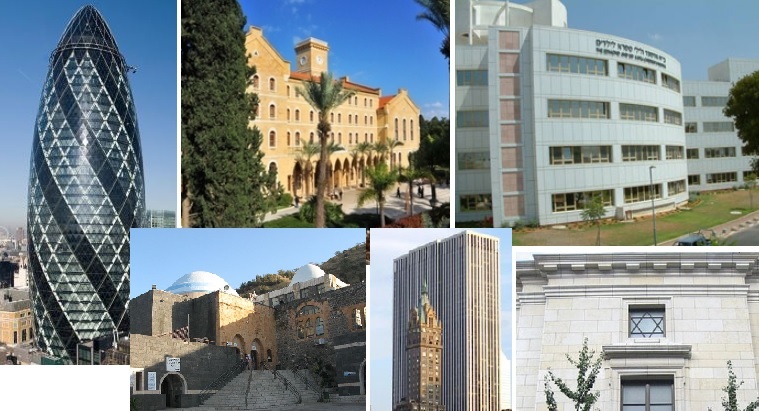 The Safras also own the General Motors Building in Manhattan (bottom centre), and fund (clockwise from top) the American University of Beirut, the Edmond and Lily Safra Children’s Hospital in Israel, the Edmond J. Safra Synagogue of New York, and the tomb of Rabbi Meir – a popular pilgrimage site. This entry was posted in Business & Finance and tagged Banco Safra, Bank, Bankers, Brazil, Brazilian Jews, Charity, Edmond Safra, Geneva, Joseph Safra, Lebanese Jews, Mizrahi Jews, New York, Philanthropists, Republic National Bank of New York, Russia, Sao Paulo, Sephardic Jews, Syrian Jews on October 3, 2018 by Jew of the Week.